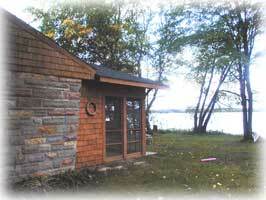 We currently offer weekly cabin rentals on Paradise Lake, just minutes from Mackinaw City & the Mackinac Island Ferries. Our rates are $1000.00 per week for the two bedroom and $1250.00 for the three bedroom with a Saturday-to-Saturday stay. A discount applies to rentals of multiple units, which is a great way to go with a family or groups of friends. The entire site can support seven couples, each having separate bedrooms, and still find plenty of sleeping for kids on sofa sleeper couches. You can show up on Saturday at any time and start to enjoy the area but the cabin may not be ready till 1:00 and we ask that you vacate the rooms by 10:00 in the morning on check out. Sorry, but we don't rent weekends except in the fall for color tours, and we don't have the facilities for large pets. Contact us for dates available. Fall and Spring rentals are exceptional times with some beautiful weather and colors galore or spring flowers and renewal of nature. Be it biking, hiking, swimming, fishing, boating, touring or plain old sit back a relax, we believe you'll enjoy the resort. We don't plan your time or schedule events, it's your place and we would hope you feel like it's your home away from home. To arrange for time or to answer any other questions please contact us.